Best management practices encompass diverse artificial groundwater recharge (AGR) systems that heavily rely upon the capacity of the soil and vadose zone to retain large quantities of organic matter generated during stormwater runoff on urban catchments. However, the supply of stormwater-derived dissolved organic carbon (DOC) at the water-table region of aquifers can enhance the rate of biogeochemical processes by fueling heterotrophic microbial metabolism. 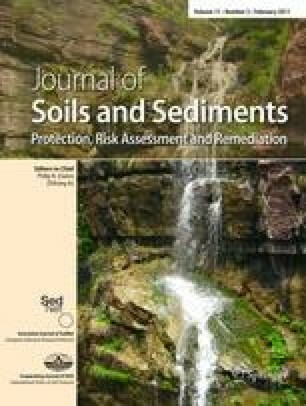 This study examined changes in the abundance and activity of sediment biofilm in response to increased DOC supply at the water table of an urban aquifer intentionally recharged with stormwater. Changes in microbial abundance and activity under field conditions were compared with those measured in laboratory slow filtration columns supplied with an easily biodegradable source of DOC. Biomass and activities of attached bacteria were measured on aquifer sediment samples collected at multiple depths below the groundwater table. The same microbial variables were measured on aquifer sediments introduced in slow filtration columns supplied with three distinct concentrations of biodegradable dissolved organic carbon (0.5, 1.5, and 2.5 mg l−1 of C-acetate). Biofilm was significantly more abundant and active beneath AGR sites than at control sites not intentionally recharged with stormwater. Individual cells also exhibited higher specific dehydrogenase and hydrolytic activities, and the protein content of biofilm was significantly increased by AGR with stormwater. The stimulation of the microbial community was all the more pronounced when the flux of DOC reaching the groundwater table was high. However, the increase in microbial biomass and activity at AGR sites was 7.5 times lower than that measured in slow filtration columns in which aquifer sediments were supplied with an easily biodegradable source of DOC. Our results indicated that the soil and vadose zone at AGR sites efficiently retained the more labile fraction of DOC, thereby enabling the infiltration of large quantities of stormwater without excessively stimulating the growth of microbial biofilm in groundwater. However, our results showed that groundwater bacterial activity was stimulated by enhanced DOC fluxes. As microorganisms experience severe organic carbon limitation in most pristine aquifers, we suggest that groundwater biofilms could be used as sensitive indicators for assessing the DOC fluxes reaching aquifers. Responsible editor: Sabine Ulrike Gerbersdorf. The online version of this article (doi: 10.1007/s11368-010-0323-2) contains supplementary material, which is available to authorized users. This study was conducted within the framework of the experimental observatory for urban hydrology (OTHU, http://www.graie.org/othu/). It was funded by the French National Research Agency (project ANR-05-ECOT-006; http://www.graie.org/ecopluies/), the French program EC2CO-Cytrix from INSU/CNRS (project “NAPCOD”), the urban community of Lyon, and the Rhône-Alpes Region. We are indebted to G. Bouger, E. Malet, Y. Negrutiu, L. Simon, P. Potier and F. Vallier for their most dedicated support with the field and laboratory work. We thank Sabine U. Gerbersdorf and two anonymous reviewers for their comments that improved an earlier version of the manuscript.